Item # 299869 Stash Points: 3,499 (?) This is the number of points you get in The Zumiez Stash for purchasing this item. Stash points are redeemable for exclusive rewards only available to Zumiez Stash members. To redeem your points check out the rewards catalog on thestash.zumiez.com. Get an extremely lightweight feel perfect for spring park laps with the Crab Grab Slush Black Snowboard Mittens. These highly water-resistant mitts are extremely thin so they're perfect for those warm and slushy days on the hill. The Snug Cuff™ keeps your mittens in place through all the jostling and the palm provides Tacky Gripple Skin for ideal feel on grabs. 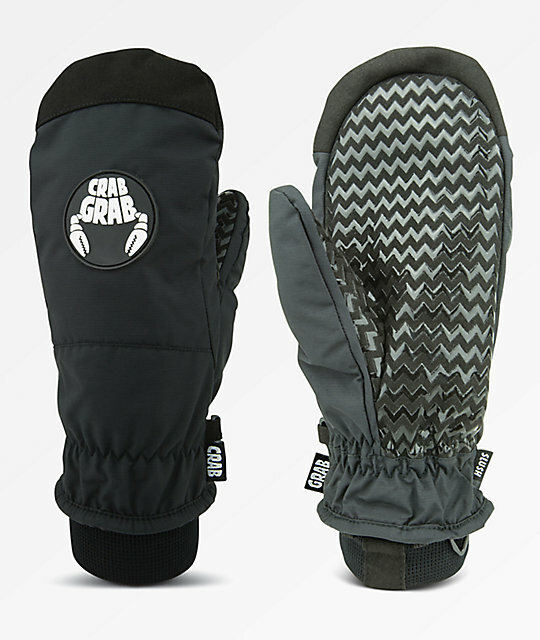 Slush Black Snowboard Mittens from Crab Grab. 2-Layer Crab-Shell Fabric (60% nylon, 40% polyurethane) treated with Durable Water Repellent (DWR) coating to prevent moisture saturation. Palm: Tacky Gripple Skin textured & reinforced palm with debossed crab claw Crab Grab logo. Very thin layer of synthetic insulation. Warmth Rating 1 out of 4: Ideal for sunny spring and/or summer glacial riding. Snug Cuff™: Cinched elastic outer cuff with internal elastic ribbed cuffs. Cool-Touch Liner: A silky & soft 100% polyester lining for comfort. Elastic leash & micro buckle connector clips for safe-keepings.